What does the ultimate community volunteer look like? Well, this is a story of the Dunsmuir Railroad Depot Historical Society’s mural and five volunteers who brought the dream of a railroad mural to life. Depot Society member and Dunsmuir resident Joseph Vella wanted to paint a railroad themed mural next to the Dunsmuir Museum entrance. This started with the idea of a painting put directly on the Amtrak Depot wall. 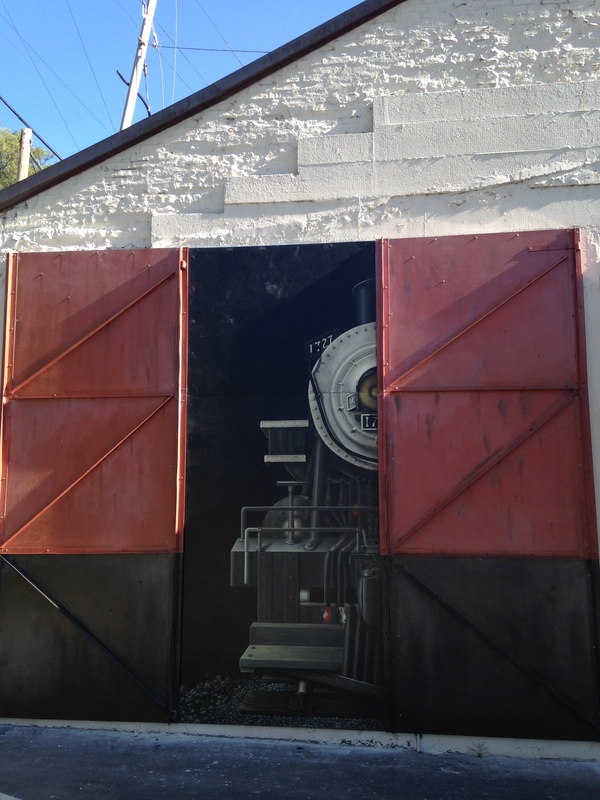 After some thought, Depot President Anthony [Tony] Skalko entered the picture with the idea of actually constructing two engine shed doors along with the painting on separate panels, one door open, one door closed, showing only half of the Mogul #1727 (the engine which now resides at the Dunsmuir Park). Tony took the plans before the Dunsmuir Planning Commission and the City Council and received their approval for the project. 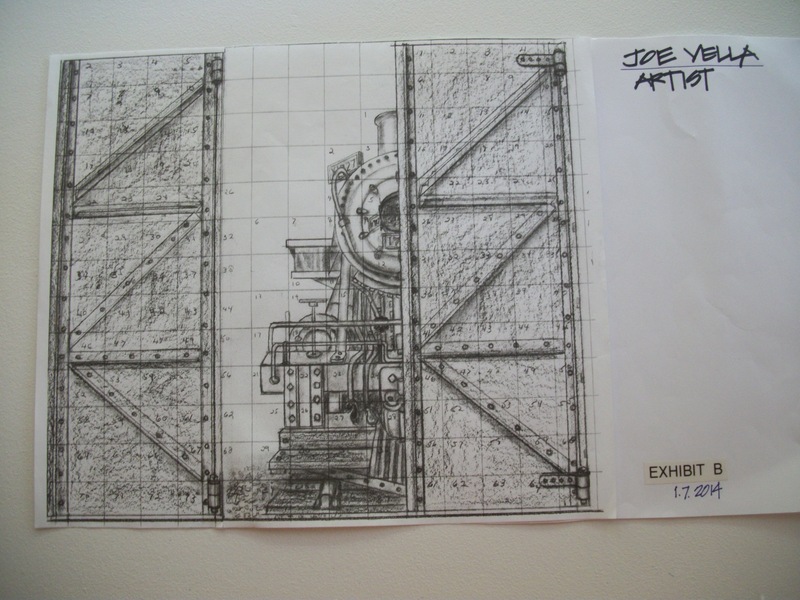 Joe began painting the large locomotive on three separate panels while Tony and Bob Billings gathered materials and designed the actual doors. As all this began to materialize, fate intervened in the blink of an eye. Tony suddenly passed away while on his way down to Redding. 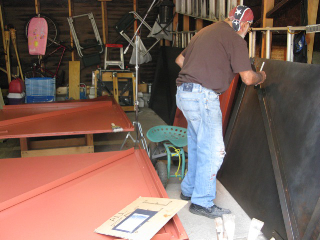 He had the entire construction of the panels and doors planned, and Tony had planned to build them. Joseph Vella painting the mural doors. Joe continued painting his three locomotive panels. Meanwhile, Mario and Steve picked up where Tony left off and devised a plan to assemble the doors and mount the whole assembly on the wall of the Amtrak Depot building. All is complete and is now mounted in front of the Museum. Plan a visit to see this masterful addition to the Dunsmuir Depot. Dedication is planned for October; we all will enjoy the fruits of these five dedicated Dunsmuir volunteers. The Dunsmuir Depot Railroad Historical Society received prior approval from the City of Dunsmuir Planning Review and from Union Pacific Railroad to paint a railroad theme mural on the Dunsmuir Museum/Amtrak Depot building. The mural is now adjacent to the Dunsmuir Museum door. The train theme mural depicts the old Malley Shed, revealing the Dunsmuir No. 1727 steam engine in partial frontal view in the open bay door. The bay doors are a mock-up of the original shed doors. Local Dunsmuir Artist/resident Joseph Vella was commissioned for the mural. His “Hello or Goodbye” painting, above the Depot outdoor bench, was painted three years ago. Vella has also added art work on the former store building on Bridge Street – be sure to see the horses he so masterfully created! His work is also featured at the SAM, and he has completed many commissioned works. Previous Pie Social 2014 a Success!